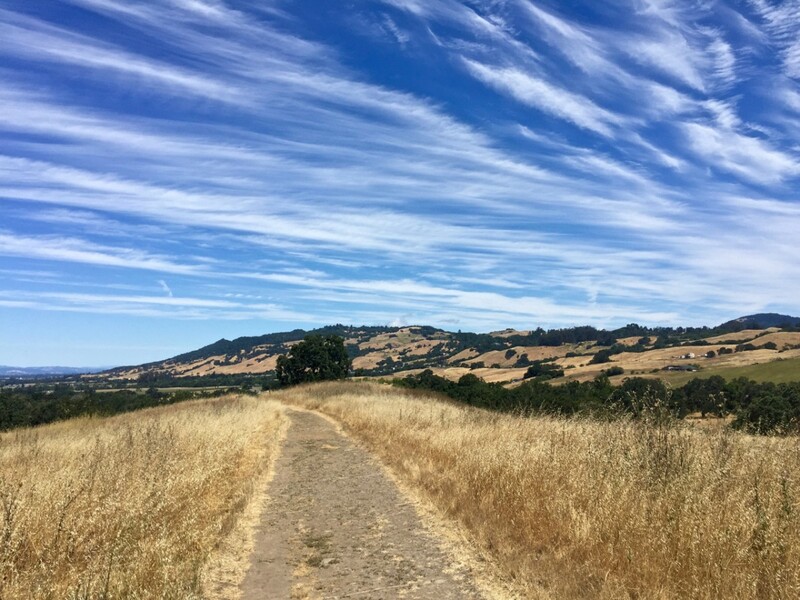 Crane Creek Regional Park is open from sunrise to sunset, and for a number of reasons those are the best times to be there during summer and early fall months. 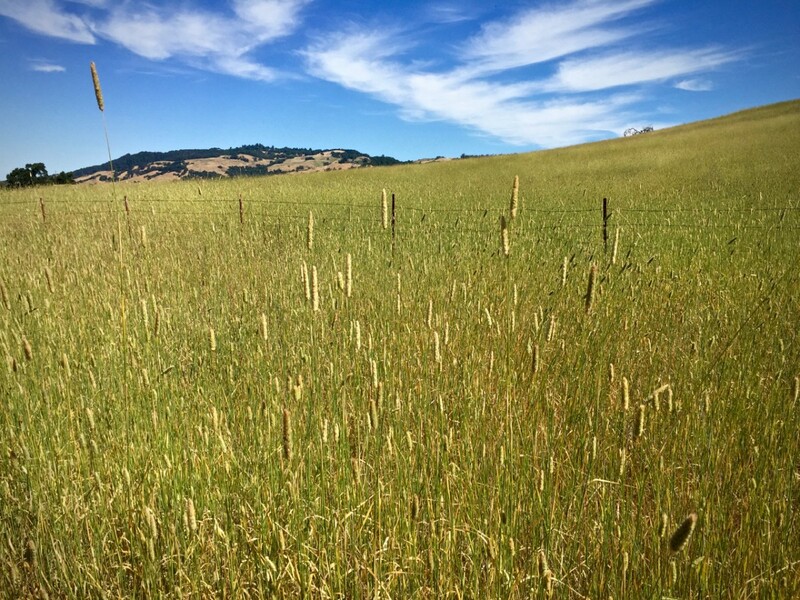 Crane Creek Regional Park encompasses 128 acres of rolling, grassy meadows on the east side of Rohnert Park. 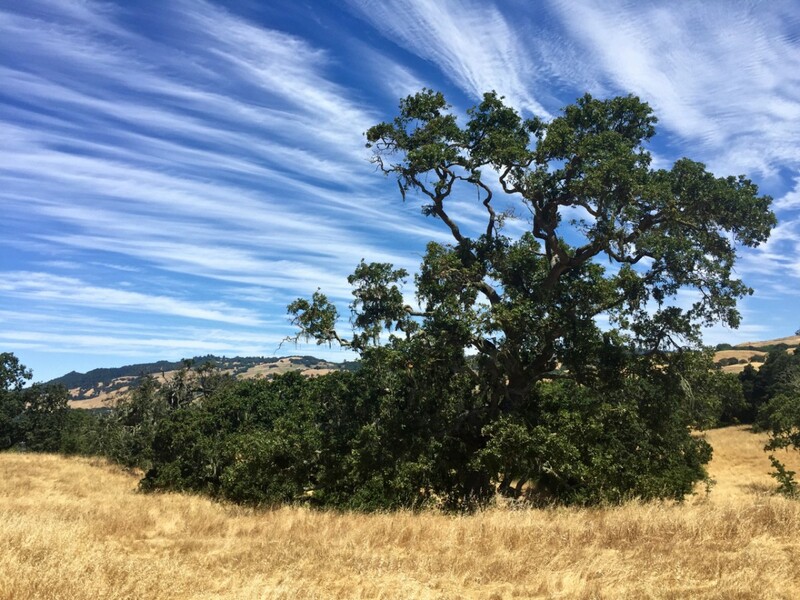 This diverse park contains oak savanna, riparian woodland, vernal pools, and bunchgrass meadows. Crane Creek and a seasonal stream flow through the wildflower-covered meadows. The park is bordered with black oak, white alder, California buckeye, and maple. Hiking, biking, and horse trails loop around the perimeter of the park. Several additional hiking-only trails explore the interior of the park. This hike leads to ridge-top overlooks of the park, then down to the bucolic setting along Crane Creek. The view. Although the park is relatively flat, four overlooks spots provide visitors with nearly panoramic views. The highest is 466 feet, accessed via the aptly named Sunset Trail. The options. Everyone is invited to Crane Creek, even horses and dogs on leashes. Several paths are wheelchair and toddler friendly. Picnic tables are scattered throughout the park, and a disc golf course is available for nature lovers who like a little competition with their fresh air. From Highway 101 in Rohnert Park, exit on the Rohnert Park Expressway. Drive 2.7 miles east to a T-junction at Petaluma Hill Road. Turn right and head 1.2 miles south to Roberts Road. Turn left and continue 1.9 miles to the posted park entrance on the left. (En route, Roberts Road becomes Pressley Road.) Turn left and park in the lot. A parking fee is required. Two paths leave from the parking lot. Begin the loop on the Fiddleneck Trail to the west (left). Pass the map kiosk and head up the open, grassy slope to a junction. 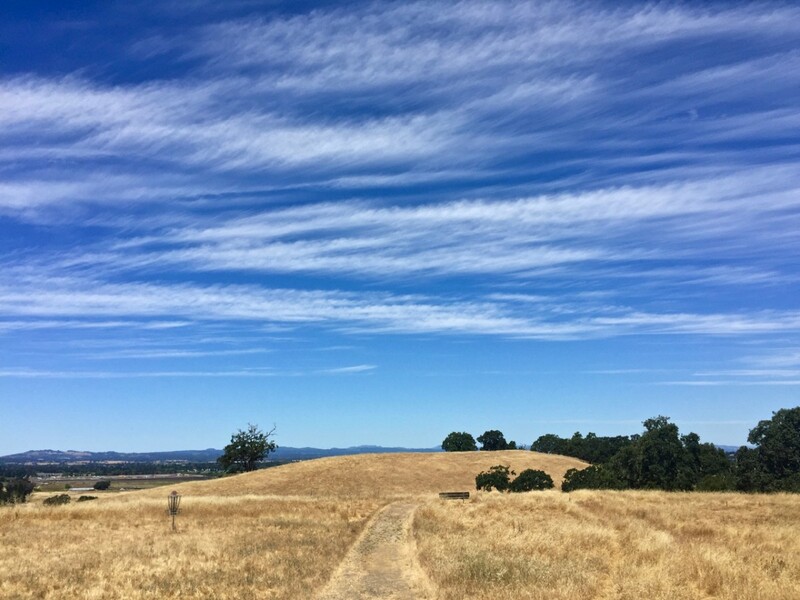 The Overlook Loop Trail veers left and rejoins the Fiddleneck Trail a short distance ahead. The Hawk Ridge Trail goes to the right. 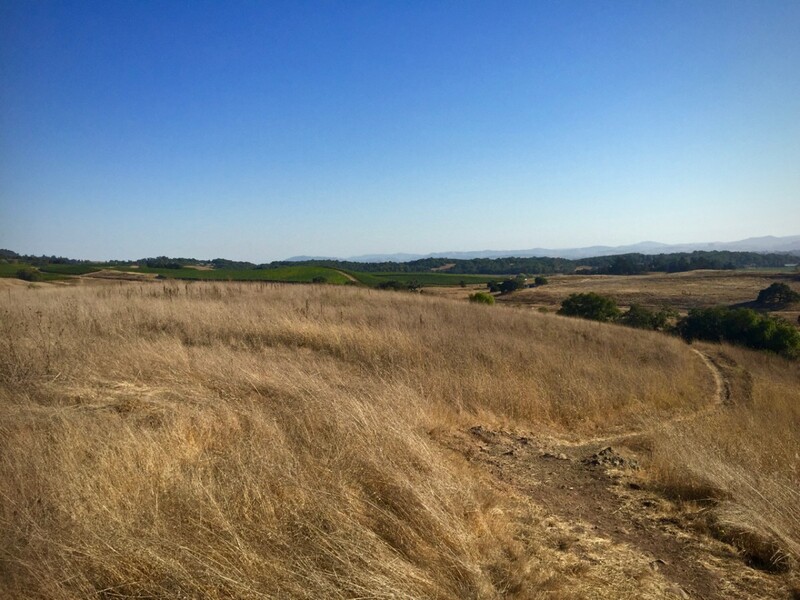 Stay on the main Fiddleneck Trail, and climb to a knoll with a bench. From the overlook are views of the entire park and the cattle-grazed hillsides. Follow the ridge to a second knoll and a junction with the Hawk Ridge Trail on the right at 0.3 miles. Detour right on the Hawk Ridge Trail to the Bowden Bluff Overlook. Return to the junction and descend from the knoll. Pass stately, twisted oaks to the fenced west boundary at the valley floor. Cross a stream to a junction with the Poppy Trail and another 50 yards farther to the Lupine Trail. 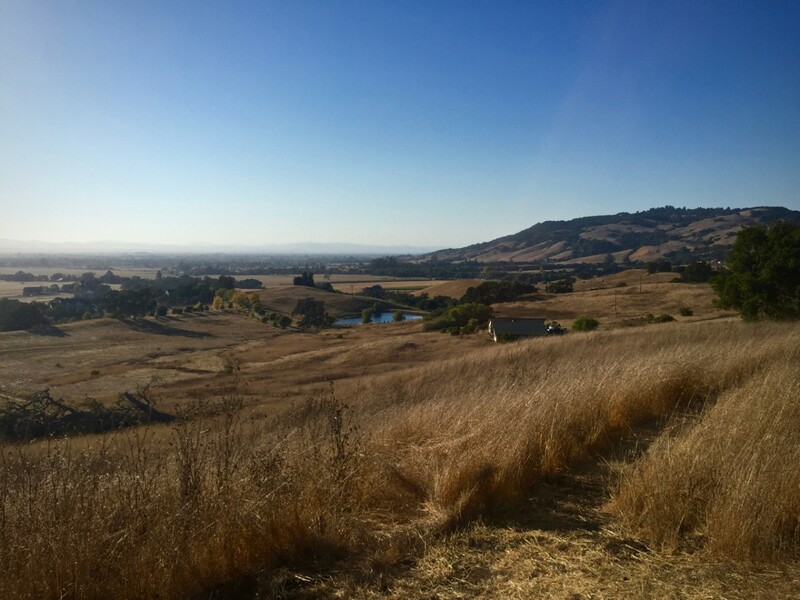 Stay on the Fiddleneck Trail to a junction with the Northern Loop Trail. Veer left on the Northern Loop, following the stream to the northwest corner of the park. Curve right along the north boundary to a four-way junction at a gate. 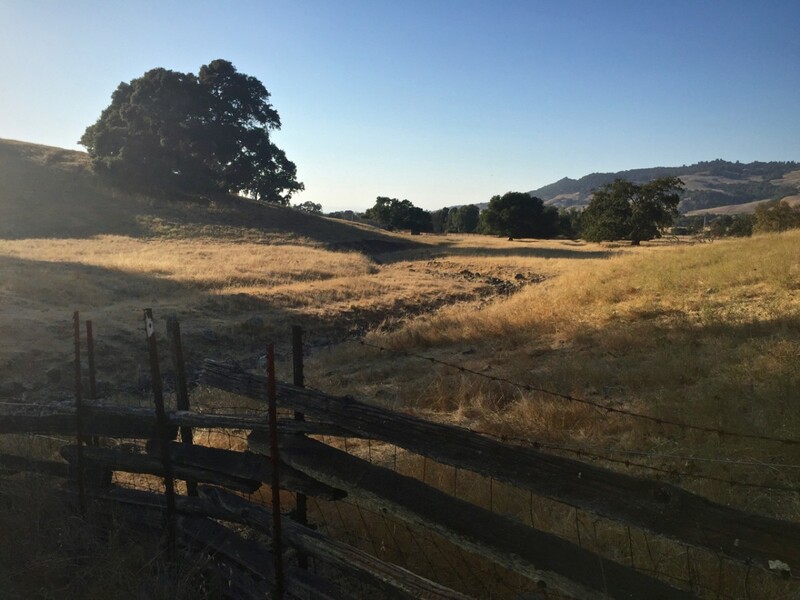 Cross the Fiddleneck Trail and pass through the gate on the Creek Trail. Stroll through the open meadow along the south edge of Crane Creek, lined with willows, alders, and bays. Pass mature bay laurels, buckeyes, and gnarled valley oaks to the east end of the Lupine Trail. Continue along Crane Creek, then curve away from the creek to a junction. The Sunset Trail crosses Crane Creek, links to the Buckeye Trail, and climbs 0.4 miles to a 466-foot overlook. The Creek Trail continues to the right, crossing a bridge over a steam to the east end of the Poppy Trail. Bear left, staying on the Creek Trail, and return to the trailhead parking lot. 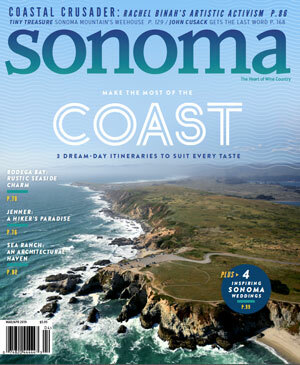 Robert Stone is author of “Day Hikes Around Sonoma County” (Dayhike Books, $21.95).